Bangladeshi History: Rah Rah or Complexity? I was lucky to have had a preview of Naeem’s essay on history before it came out. This past week, I read the comments from AoD readers and they provided much food for thought. Great writing in response to the same. A few thoughts on the comments over the fold. Somehow I feel that had he [Naeem] and his fellow western trained history professionals been more strident in establishing a tradition of critical and social science study of our creation history, we could have been in a much better place. I suspect that rather than get into friction with our historian titans in media and academia, they opted for accommodation and gradual change. The failure of that approach is now evident. Any attempt to critical and methodical study will now straightway land them in the same lump of Sharmila Bose or worse. The rest of the comment can be found here. What I found interesting is the divide that Shafiq draws consciously or unconsciously between academics practising in Bangladesh versus those doing research abroad. My feeling is that this divide is real. The history of 1971 is too fresh and its consequences still too much with us in Bangladesh. Just as Hollywood is still unable to give us an “uncontroversial” 9/11 or Iraq War movie, similarly Bangladesh-based academics have not been able to give us anything unaffected by “Rah Rah Nationalism”. Foreign-based Bangladeshi academics on the other hand have a distance from the homeland that translates into temporal detachment from the events of 1971. The emotions calm down, research grants or careers do not depend on whether one is perceived to be sufficiently pro/anti the canonical story told by one party or the other. One feels relaxed to twist and turn events and inspect them from all possible angles – if only to reject 98 out of 100 such perspectives. Real historical research can then take place, as opposed to the mythology of good and evil that so often passes for history. For reasons of convenience or competence, Naeem and the others have chosen to operate exclusively in English, thereby drastically limiting the audience for their research. They will all continue to do extremely valuable work, I have no doubt about that, but as long as no effort is made to reach out to the majority’s language, they will sadly continue to imprison their writing in a self-made linguistic ghetto. This is unfortunate because a piece like this really needs to be available in Bangla, making a dent in the national consciousness. Again, my gut feeling here is that the English-Bangla blogging divide maps on to NRB’s/deshis (with significant exceptions both ways of course). And my gut also tells me that if Naeem’s essays on this subject were available in Bangla, they would be subject to an on-the-record criticism of not being pro-71 enough and an off-the-record “criticism” of having been written by an NRB who has lost touch with the Deshi zeitgeist. Again, that divide between those who are or can afford to be detached because they are not living in Bangladesh, and those who are living inside the country and have to pick a side. Let’s get the self-criticism out of the way. It goes something like this: the detachment is a symptom of post-industrial, post-modern societies with established canonical versions of history. Because they have a canon, they have the appetite and tolerance for this detachment, for the narratives at the margins of the canon. In this worldview, this detachment is an inappropriate, alien import into Bangladeshi historical research: a post-modern critique of a modern attempt. A bit like advocating for Digital Bangladesh before the Analog version is up and running. Instead, we should allow this Rah Rah phase to play itself out and let the detachment grow organically. It sounds plausible, except it really doesn’t stand up to serious scrutiny. If the detachment is an imported idea, why is this “we need a canon and then we can be detached – just like the West did it” idea also not an import? Why can Bangladesh not be that unique country – one whose history admits its own complexity, its own plurality from its very birth? After all, we are unique in so many other ways. In this, it would be wrong to simply pinpoint the blame on the pro-1971 people who occupied Shahbagh last month. The appetite for a complicated history is even less on the part of Jamaati/Islamists who have made Titumir their quintessential Bangali Muslim hero because he fought off “Western Imperialism”. That is simple, rah-rah history of another kind in action. One of the best studies of the complex factors behind how this area of Asia became Muslim comes from an American academic sitting in Arizona. That is irony in action. The state of historical research in Bangladesh is a symptom of the political and cultural influences on academia. We have heard ad nauseum about the political influences, but the cultural influences are no less potent. What incentives does an academic historian face in, say, trying to do evidence-backed research on Bihari-speakers who aided their Bangali friends and neighbours in 1971? Will the Shabaghi bloggers set up tents in front of his office and ask for his resignation? What if it’s tracking the refugees who went to West Bengal and the Indian Bangalis who assisted them? Will they be called India’r dalal and subject to violence by the basherkella crowd, and scathing pieces in Amar Desh? Is it not better for such a historian to either not have anything to do with 1971 or to fall in line with one of the opposing camps for protection? That seems a much safer way to a hollower fame. 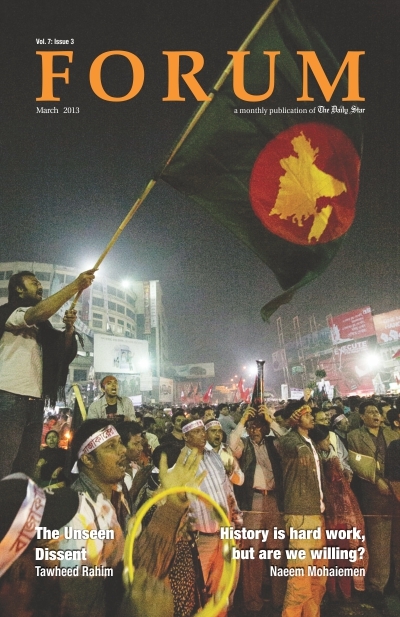 Shahbagh has not improved this polarised situation in the least. Those of us who take a dim view of Shahbagh (and I speak only for myself here) have been accused of many things this past month. I have also noticed an emergence of new supporters from among more Islam-ponthi political segments nodding along with my critique. What neither camp seems to understand is that my criticism of Shahbagh stems from a very patriotic place that takes my Bangladeshi identity as a given. As a Bangladeshi, I have dreams for my country and a right to voice them. The Bangladesh of my dreams is a plural one, given to multiple narratives, multiple histories that come together to form the Bangladeshi identity. The canonical version of history must encompass everyone and everything without losing nuance. To be Bangladeshi is to embrace a complex identity. A long time ago the Jamaat-Shibir crowd closed the door on this kind of pluralism in their version of Bangladesh. The great tragedy of Shahbagh is that the door to a plural Bangladesh has now been further closed from the other side as well. What a childish retort to the basherkella image appropriation from what are probably 12 year old girls accessing a similar feeling of unjust treatment. Titu Mir can come across a bit of a thug at worst, but what undid him was how his enemies spun him to the british authorities. today we have another generation of religious-political revival being framed by its enemies. ‘Sharmila’ Bose as a device to thrash (salute the flag) then follow up with some conciliatory sounding words (sound liberal) is a pattern of engagement that i’m seeing in in the sugar sweetening renderings of shahbag too. I think its a problem of guts. How do you break it ‘nicely’ to masses of dedicated and angry people that the ground they stand on is liquid? Would you risk social and career suicide by liberating yourself from the lie? The Macauley Minutemen and Women who sustain the singular Narrative have been found wanting. Dead Reckoning remains a well evidenced piece on the multidirectionality of violence in the official warlore beyond the 25th March 16th December bookends. It confrims and contests much of the sacred urban content of Operation Searchlight, Rumi’s demise and intellectual killings but also looks to the rural lands and mufassul towns. More post Shahbag reflections on our rich tradition of lynchmobing scholars, polticians and anyone we suspect of dalalism, I hope, will lead to better socio-judicial conditioning of our pluriversal reality. Thank you. You’ve given me inspiration for part two: the intellectual cadre of each camp (Shahbagh and basherkella) spend a lot of time turning their analytical eye on the other’s liquid foundations. If someone turns it on them suddenly it causes discomfort and for them to lash out. Like journalism analysis is something done to other people. You try very hard to sound intellectual. But truth is you are a footsoldier for a misguided cause. my pleasure to give you inspiration. you are dong well. there is much that is similar between the ijtemas. Key difference being that one is getting its head kicked in and the other is the local hegemonic common sense. Relevant links are posted below. Truth is one is getting its head kicked now. And the other performed a head kicking and worse back in the day which you deny. You seem to have mistaken politeness for a lack of sarcasm in my last comment. Madam Sarmila Bose is a practitioner of descriptive history. Descriptive history is nothing but story of ghosts (Bhuter Kirtan); different ghosts become important in different phases of time. History should not be descriptive. History should be analytical, with a full illustration of law of cause and effect. What is the cause of 1971 struggle? Pak army denied to transfer power to the elected majority of parliament, the Awami league. Jinnah was in problem with brute majority of the Hindus; so he was in need of partition for his empowerment. But after partition, Pakistan faced the problem of Bengali majority. In Pakistan, any democratic election is bound to put Pakistan under Bengali-influenced government. Pak army wanted to get rid of that. So the whole scam. What is the effect of 1971 war? The Bangladesh itself; No new ghostly discovery can dilute this cause-effect analysis of history. If Bihari ghosts speak of one kind of story, 1964 riot victims will say another story. In 1964, Bengali Hindu dominated cotton mills were destroyed and cotton mill worker were killed mainly by Bihari Muslim rioters. Thus west Pak cotton mills established their business. Let Madam Bose be happy with her ghosts. Let Ghosts of Pakistan also be happy. Those who died for Bangladesh, their death are martyrdom. Those who died for Pakistan, their deaths are a matter of joke, because “united” Pakistan disappeared. The Bihari ghosts are posthumous jokers also. Human being dies one day; nobody remains alive in this world for ever; however, all deaths are not equal. When one dies in the arm of grateful fatherland, death ends; prison wall breaks; finally with death, life begins. But not with all the deaths; when one dies in his act of enmity against the people’s verdict, their death becomes a death without proper cause. When they were alive, they were alive for nothing, and when they died, they died for nothing; this nothing is nothing but “united Pakistan”.